Ukraine's outgoing President Leonid Kuchma says he is willing to sack his government on certain conditions, in an effort to resolve the country's crisis. He demanded that powers first be transferred from the president's office to the prime minister and parliament. Ukraine's parliament has demanded the government be disbanded and fresh elections called after last month's vote was widely discredited. 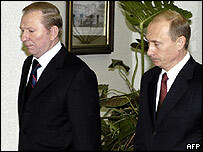 Mr Kuchma was speaking after talks with the Russian President Vladimir Putin. Mr Kuchma - who is in Moscow - said: "We need urgently to conduct constitutional reform. The cabinet will resign after changes to the constitution are made, and a new cabinet will be formed." The opposition has yet to respond to his proposal. Mr Kuchma's chosen successor, Prime Minister Viktor Yanukovych, was declared the winner of the poll, but opposition leader Viktor Yushchenko and his followers allege massive fraud. Both Mr Kuchma and Mr Putin have called for a complete re-run of the presidential election. Mr Putin also expressed concern about a possible split between the west of Ukraine, which generally supports Mr Yushchenko, and the east, which tends to lean towards Russia. He praised President Kuchma for keeping the situation under control. Hundreds of thousands of opposition protesters are on the streets of the capital, Kiev, while government supporters have massed in the eastern city of Donetsk. 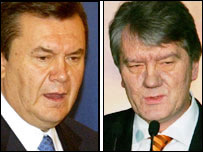 Mr Yushchenko has called for just the second round run-off between him and Mr Yanukovych to be re-held. Correspondents say the new elections option would allow Mr Kuchma to stay in power for a few more months, and find a more popular alternative to Mr Yanukovych, who was his chosen successor. Meanwhile, US President George W Bush has said any new poll should be open, fair and free of foreign influence. Talks between Mr Yanukovych and Mr Yushchenko are on hold pending a Supreme Court judgement on the allegations of electoral fraud. The court adjourned on Thursday without making a decision and was set to return the following day. Mr Yanukovych now seems to agree that the second round should be invalidated. But, like Mr Kuchma, he wants a clean start, and new elections from scratch. He has said he will not step down and described parliament's no-confidence motion against him as illegal. There is confusion over what should happen next as a result of the parliamentary vote, but a lawyer in Kiev who spoke to the BBC's Stephen Mulvey said the president was now obliged to sack the government. After the vote, Mr Yanukovych submitted his own complaint to the Supreme Court alleging irregularities on 21 November in certain voting districts in western Ukraine and Kiev - strongholds of Mr Yushchenko's. Mr Yushchenko has urged his thousands of supporters, who have been out in force in Kiev for 11 straight days, to stay on the streets until a new election date is agreed. Have Orange ideals been met?